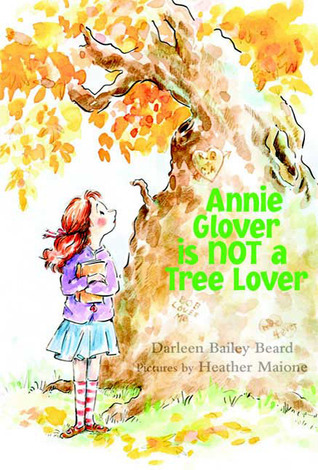 Darleen Bailey Beard is an active member in our local Oklahoma SCBWI chapter who has published six books including The Babbs Switch Story, Twister, The FlimFlam Man, Operation Clean Sweep, The Pumpkin Man from Piney Creek and her latest book, Annie Glover is not a Tree Lover. Last fall at one of our conferences, Darleen did a fantastic talk on school visits. I was so inspired that I asked Darleen if I could come along and watch her in action some time. She was very encouraging about the idea and this spring we were able to coordinate our schedules. During that fall talk, Darleen said that one thing we as writers could do that teachers couldn’t was get kids excited about writing. 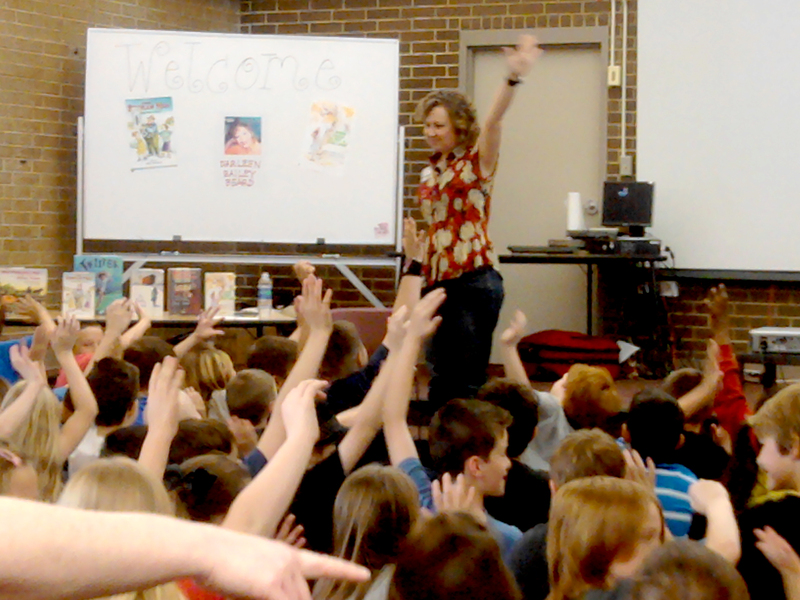 After watching her do a school visit, let me tell you, she can also get kids excited about reading. 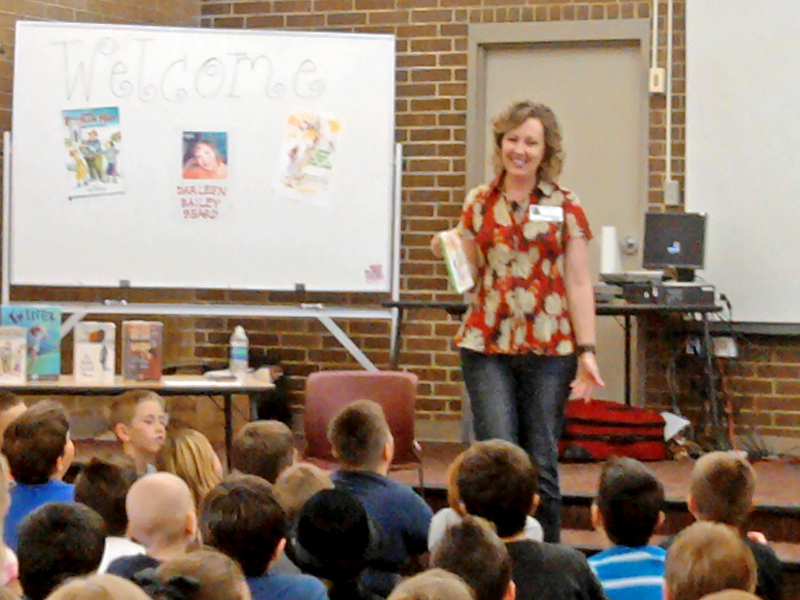 It’s not an easy thing to hold the attention of a room full of 3rd and 4th graders, especially if you’re a complete stranger, interrupting their day for an hour to talk about books and writing, but Darleen Bailey Beard captivates her audience of readers – voracious and reluctant alike – by reaching out to them at the very beginning. She starts off by telling the kids stories from her own childhood about how she always wanted to find something that she was good at; how all of her friends were great at swimming or great Girl Scouts or being the prettiest, but she was never good at anything. What kid can’t relate to that? She takes them on her own journey of self-discovery through a lens they can understand, just like any great storyteller. The kids are enraptured. She asks them questions, gets them involved, and then tells them a secret about herself that is totally and completely…embarrassing. Do they really want to hear it? YES!!! Oh, she is theirs for LIFE! enthusiasm. School visits are not for the weak. Darleen was often surrounded by kids, receiving hug after hug (for being a writer of a book they loved!) and still she found the time to talk to the lingerers who were too shy to speak to her in front of the crowds. One girl barely raising her voice above a whisper told her how much she loved to write, too. Maybe another future author being born. I knew all of this was why I wanted to write. To matter. To make that emotional connection that only written words can facilitate. Now I understand why Darleen has unofficially been crowned Queen of the School Visits. She has earned that title. Several weeks have passed since that author visit and I asked Darleen if she would answer some interview questions for me. Ever giving of her time to her fellow writers, she agreed. VL: As a young kid, what was the worst trouble you ever got into? And what was your punishment? DBB: Hmm, that’s an interesting question. The first thing that came to my mind was when I threw my sister’s Barbie doll out the car window. We were living in [Pennsylvania] and our way to visit our grandparents in [Oklahoma]. My sister was five years older, five years bigger, and five years smarter than me. She was doing something and I can’t remember what it was but it was bugging me. I held her doll up by the toe and said, “If you don’t stop it, I’m going to throw this doll out the window!” Well, she didn’t believe I had the guts to follow through with my threat, so she kept on doing whatever it was she was doing. So after I’d had enough, I rolled down the car window and thwack! I threw that doll right out the window! Of course, she had to tell on me and my dad didn’t want to stop the car to go back and look for it on the highway, so when we got to [Oklahoma] to visit my relatives, my punishment was that I had to sit on the bed in the back bedroom at my grandparents house while everyone else got to visit and hug and share in the excitement of our arrival! But I have to say, it was worth it! Ha! VL: Whoa! Guess your sister believed you from then on. What did you want to be when you were in grade school? What influenced this choice? 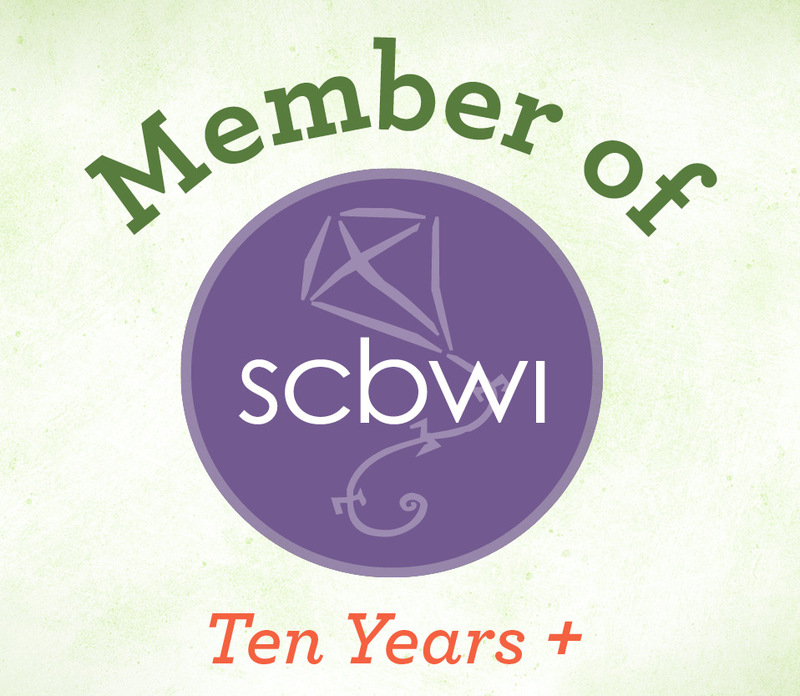 DBB: This is an easy one–I knew from the age of 10 that I wanted to be a writer. I fell in love with writing when my fifth-grade teacher would make us write stories with our spelling words every week. I knew then that I wanted to be a writer and have been writing ever since. VL: Thinking back to your childhood heroes /role models when you were a kid, who were they? What drew you to them? What powers/abilities did they have that you wished you could have? Do you still feel that way about them now? DBB: My role model was my fifth-grade teacher. She made me believe in myself. She was an amazing teacher and did so many creative things in our classroom. She even made a jail cell out of a refrigerator box and put a chair in there and magazines so that if anyone misbehaved in class, they had to go to jail and the only thing there was to do in jail was read…imagine that! She had this amazing bulletin board in the coat closet area where she put current events from the newspaper on it and added to it on a regular basis. She would make us write about these current events and I remember standing in the coat closet just looking and looking at that bulletin board. Somehow just looking at that board made me realize how big the world really was and she made it look so exciting and fun. She made learning and education fun, too, which was something my other teachers had not managed to do (with me, anyway!). She made every single day a day to look forward to in the classroom. She was tall, too, and I really liked that because I was such a tall kid. I was taller than my third-grade teacher and as tall as my fourth-grade teacher, so when I walked into my fifth-grade classroom and saw this six-foot teacher, taller than me, I was thrilled! I loved having a teacher taller than me. VL: Reading jail! The horror! She sounds like an amazing teacher; no wonder she inspired you so much. I think we can all relate to that one teacher who touched our lives for the better. Teachers ARE heroes. Were you ever afraid of the dark, of anything under your bed or in your closet? DBB: My sister and I had bedrooms on the second floor of our house. In the middle of our rooms was a hallway and a bathroom. We always managed to forget to turn off the hall light and we’d each lie in our beds yelling to the other to “Turn out the light!” until one of us would eventually get up and go turn off that light. How scary it was to run back to bed in the dark! VL: Who was your childhood best friend? Are you still friends today? DBB: My best friend was Kathy. Kathy would pick her eyelashes out. A strange thing. And she’d eat her own Kleenexes. Another strange thing. But what fun we had playing tricks on the neighborhood kids and riding our bikes to the 7-11. We are still in contact but not much. Being the writer that I am, it’s easy for me to write or call but it’s harder for her as she works at night as a nurse and sleeps in the day. I wish we were still in touch but we haven’t talked in a couple years. I think I’ll go call her now! VL: Did you ever have a clubhouse or secret place of your own? What did you do there? DBB: Kathy had this wonderful beautiful cherry tree in her backyard. We would play Barbies under this tree. It had tons of cherries and it was such fun to eat the cherries. One cherry would make an entire meal for our Barbies. We also played in my game closet in my bedroom. It was this small closet which my dad had built–around 4 feet by 4 feet. We’d get in there and play games and eat sugar cubes! VL: Tell me about the most interesting place you have ever lived. What did you like/hate most about it? DBB: We lived in a motel for about six weeks. We were moving from [Pennsylvania] to [Arkansas] where my dad had this crazy dream of owning his own chicken ranch. Anyway, we lived in a motel because the van line that was moving our belongings went on strike after it took all our things. So for six weeks we had no furniture, no clothing, no nothing. We didn’t know what else to do, so we ended up living in a motel. We rented two rooms, side by side, with a door that opened between the rooms. And that’s where we stayed. My parents wouldn’t buy me any new clothes (not sure why, but I guess they didn’t have the money??) and so I had to start my 7th grade year with only the few clothes that we took in our car on our move. I think I had a total of three pairs of shorts and three shirts and had to wear these very same clothes for six whole weeks! I also remember wearing a pair of my mother’s shorts which were too big for me and came way down to my knees. Boy was I glad when the van lines stopped their strike and I got my clothes back! During that time I remember being very creative and doing a lot of painting and coloring and jewelry making as there was nothing to do in a motel room except that or watch TV. VL: I imagine starting a new school year like that in a new state must have been very challenging. What was the worst job you ever had while going to school? Do you have any interesting stories about working there? DBB: Going through college, I cleaned houses. I had this one customer, Mrs. Kelly, who would follow me from room to room watching me. She watched my every move. When I cleaned her toilets, she stood over me, making sure I did it right. Then she would make suggestions while I cleaned like, “Use only one paper towel” or “Don’t touch the walls with that paper towel” or “Be sure to get that spot off that dish” or “Dust with only one spray of polish, not two sprays.” She drove me nuts. She didn’t even like it if I moved her furniture to vacuum. She’d get mad if I moved her chair one inch. THEN she started going to her bedroom closet and coming out with different clothes on when I was there. I’d be in the kitchen and she’d come out modeling some new dress and new shoes. I’d be in the living room and she’d come in there with another dress and shoes. She’d twirl around and want me to compliment her. Of course, she was just a lonely, old, obsessive-compulsive lady with a touch of dementia but she drove me nuts. After working for her about one year, I finally quit. VL: Wow. She would make quite an interesting character in a book some day. She reminds me a little of Annie Glover’s Grandma. I think you lasted at that job much longer than I would have, and I’ve had some pretty crazy jobs myself. What is your current writing project and what can you tell us about it? DBB: I’m working on a book called “Princess Dandelion of Valley View Mountain” and it takes place in southeast [Oklahoma] during the Depression in 1931. It’s based on a true story about a girl who lives in the traveling lumber camps that existed in that area until 1963ish. She finds a starving mule and tries to keep it from dying and wants to bring it home. Of course, her parents don’t want a mule or have money to feed a mule so the fun begins. How is she going to convince her parents she needs this mule???? She’s also convinced that she doesn’t need a friend–she’s moved from town to town to town and has lost a lot of friends in her many moves–so she doesn’t want to bother with making another friend in her new lumber camp but the girl who lives next door is determined to be her friend. This, too, causes some fun trouble! VL: I’m really looking forward to that one. Thanks so much for taking the time to answer my questions. It’s been such a pleasure getting to know you better! 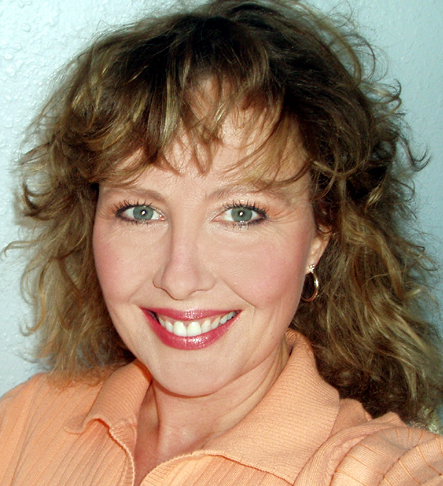 If you would like to learn more about Darleen Bailey Beard and her books, check out her website at www.darleenbaileybeard.com. Great interview. I had talked to Darleen about watching her at one of her school visits. I really to follow up on that!